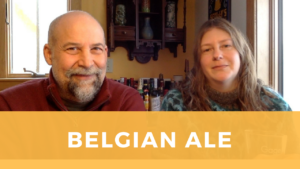 Homebrew Tasting of a Belgian Ale Called "To Huell With It"
Click to watch video tasting! While Belgian Ale is a style that’s often enjoyed during the warmer months, this effervescent and refreshing beverage can be the perfect accompaniment to rich holiday feasts. In the video, Rick and Sarah taste the second beer from the Parti-gyle brew day that Rick did a few weeks ago. There’s many more articles and videos on homebrewing on this site!